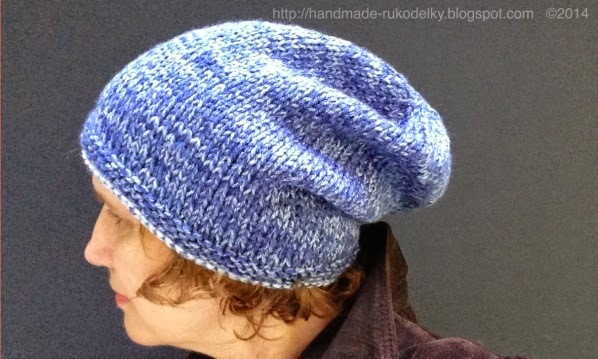 I was approached (via internet) by one of my subscribers to do a knit along video of me knitting a slouchy hat. I could not do it right away, because my summer was very busy. I thought about the project for about two weeks and finally two days ago I was able pick a yarn from my stash, gather all my materials, set up all my equipment for recording, sit down, and video tape while I was having fun knitting. Today I finished taping. Which means that all my videotaped material had to be transferred from video card into my computer, opened in the editing program, edited (cut out the stuff that would make video too long), then saved as mp4, and finally uploaded to Youtube. And here I am now writing the pattern for this "Slouchy Hat". 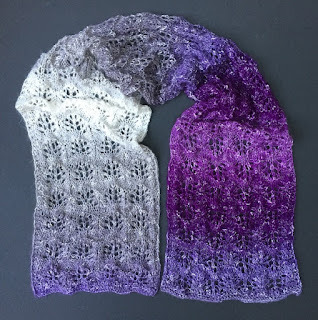 Click HERE to see knit along video. If you cannot knit on double pointed needles then circular needles will do. Weave in all tails/ends. Enjoy.